Slip and fall accidents are a common everyday occurrence in which people get injured. In some cases, the injuries sustained from slip and fall accidents are very serious and result in life-altering damages or even death. 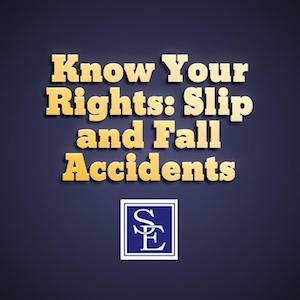 Slip and fall incidents are often the result of a dangerous condition caused to exist on someone else’s property that needlessly endangers those come onto their premises. Failure to protect others or remediate a dangerous condition that causes a fall resulting in an injury can be recoverable. If you suffer an injury as a result of a slip and fall accident, it is important to immediately review the circumstances with an experienced personal injury attorney who can properly assess the accident, the conditions of the property where you slipped and/or tripped and fell, in addition to your injuries and related damages. Our New Jersey lawyers are available to speak to you and help determine whether you have a viable case against those responsible for causing your accident and injuries. In the event you or a loved one has suffered injuries resulting from a slip and fall accident, it is important to act quickly. Photographs of the location and surrounding area that caused your injury can be very important for your case. Retaining an experienced lawyer will result in immediate action to preserve the scene of the accident and assess, evaluate and gather evidence is critical. Additionally, it may be necessary to immediately retain an expert to go and inspect the area where the accident occurred to determine whether negligence has caused or contributed to the accident. Our personal injury lawyers are well versed in accident law and able to take immediate appropriate action on your behalf. Injuries from slip and fall accidents can range from minor injuries such as bruises and scratches to much more serious and permanent injuries. Slip and falls and trip and falls can result in broken bones such as broken ankles or legs. It is also not uncommon for injuries such as broken arms or wrists to occur resulting from a person’s reaction during a fall to stabilize themselves by using their arms and hands. It is also not uncommon for a person to hit his or her head during a slip and fall or trip and fall. Head injuries resulting in concussions, traumatic brain injuries, life altering consequences and even death can be caused by a slip and fall or trip and fall accidents. If you or a loved one has been injured as a result of a slip and fall or trip and fall, you may be eligible to recover damages for your physical or emotional injuries and economic damages. But, you must be able to prove that the injuries and damages you suffered were the result of or caused by the negligence or dangerous condition which existed on the property. A factor may include the need to show that the owner or person in control of the property or the premises knew of the dangerous condition or could have or should have known of the dangerous condition which caused the injury or damage. We can help represent you in assessing your injuries to help you determine if you can pursue a claim against those responsible for allowing the dangerous condition to exist. Our New Jersey law firm represents people who have suffered injuries, including serious injuries, due to the negligent conduct of others. Because our New Jersey personal injury lawyers understand that our clients and their family members are going through confusing and stressful times, we focus on openly communicating all the options during the litigation process. If you or a family member has been injured by the negligent, needless or careless acts of another, our New Jersey personal injury lawyers can help hold those responsible for the harm they caused.